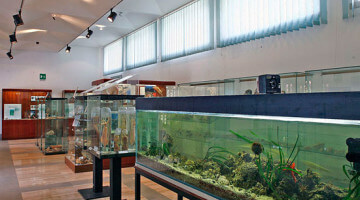 The museum is divided in three halls: one concerning sea biology; the other, itself divided in two sections, the evolution of the coast during the Quaternary age and underwater archaeology. The museum gathers sound and visual material, plastic models, photographs and images of the palaeontological, palethnological and historical entity of Sabaudia and the Pontine Region. Also on show are fossils from the ancient Tyrrhenian Sea, obsidian tools from the Neolithic age, Roman relics (concerning the marine theme) and shells from all the malacological areas of the earth. A third hall, includes relics from a Roman ship that sunk off the coast of Sabaudia, relics from both the classical age and modern age, roman coins dating back to the imperial period. Particular emphasis is given to the visuals were ways of using natural resources for the economic benefit of the sea town are illustrated.